Club Penguin Cheats by Mimo777 Club Penguin Cheats by Mimo777: Official Club Penguin Annual 2013 available in the UK! 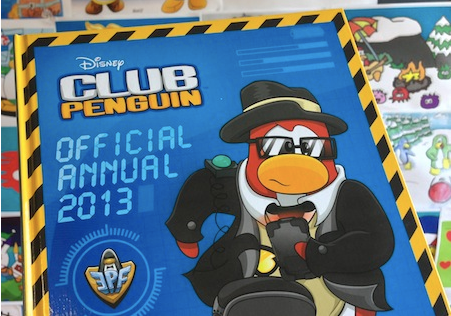 Official Club Penguin Annual 2013 available in the UK! Hey there all you UK players! Guess what! This year's Official Club Penguin Annual is out in the shops now! Woo hoo! It has TONS of puzzles and quizzes, including a cool Secret Agent Exam! Awesome! Are you going to pick up a copy of this!? oh my gosh -_- Why can't the US get stuff like this. US hardly gets anything! WHAT!!!!!!!!!!!! The US gets everything! mimo, you haven't had a party in forever! oh my gosh -_- Why can't Zanzibar get stuff like this. Zanzibar NEVER gets anything! Australia has already got it. Oh, why don't other countries get them? I know there are a LOT of countries to cover, but Club Penguin hey I'm an Australian. Gosh, I don't think AUSTRALIA was so hard to get... by the way I am an African I live in AUS. You live in ZANZIBAR?! Oh, wait... I actually don't know where that place is. My name on Club Penguin is Smilegirl719 or Waddles406. Be my friend if you see me... Get those through your THICK head! Your head isn't thick? Oh yes, it's hollow.